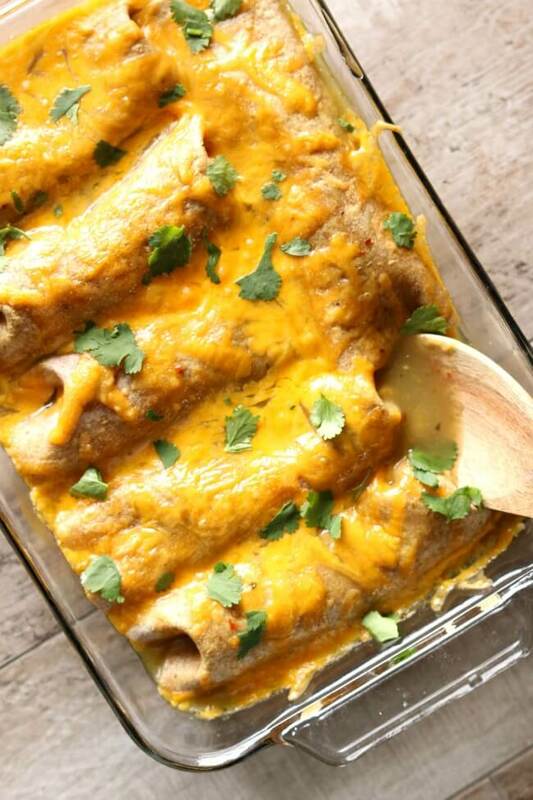 Enchiladas are a staple in my house for dinner. I love the ease and versatility of them. 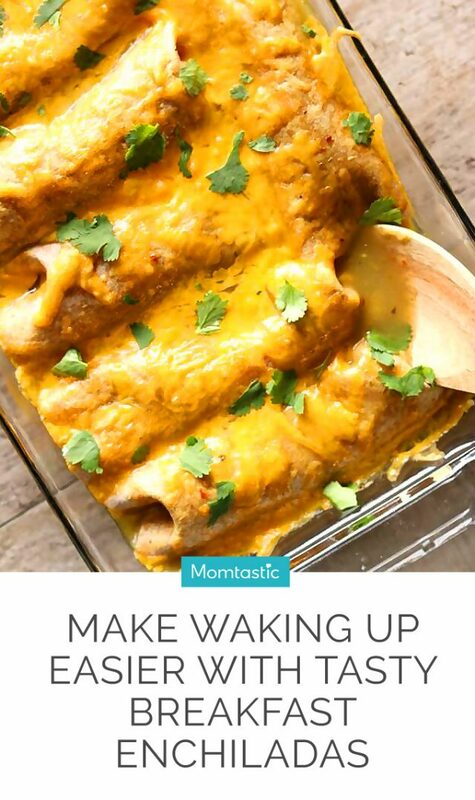 But recently, my husband and I have started making breakfast enchiladas in the morning or when we are expecting a crowd for brunch. A single bite of this includes all the best parts of breakfast: eggs, cheese, sausage, potatoes. But you can customize it to your liking and avocado, sour cream, or anything else you’re craving. The recipe for these breakfast enchiladas is super easy, and you can take an additional shortcut by browning the sausage the night before. You could even prepare the entire dish ahead of time, too, and pop it in the oven in the morning when you’re ready to eat—which is great for those of us who love our lazy weekend mornings. Want to up your brunch game with a comforting and crowd-pleasing meal? 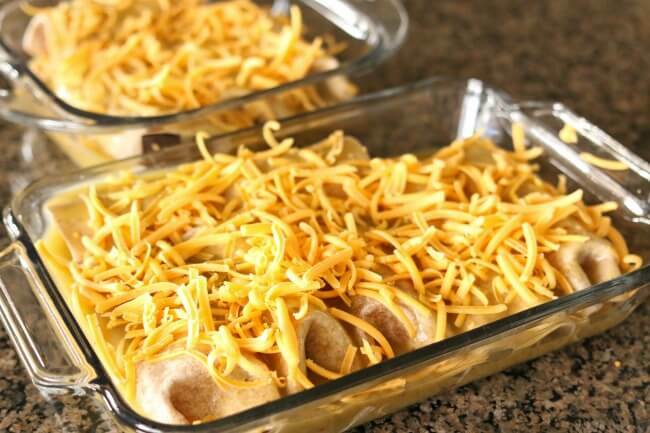 Follow my step-by-step directions for breakfast enchiladas below. 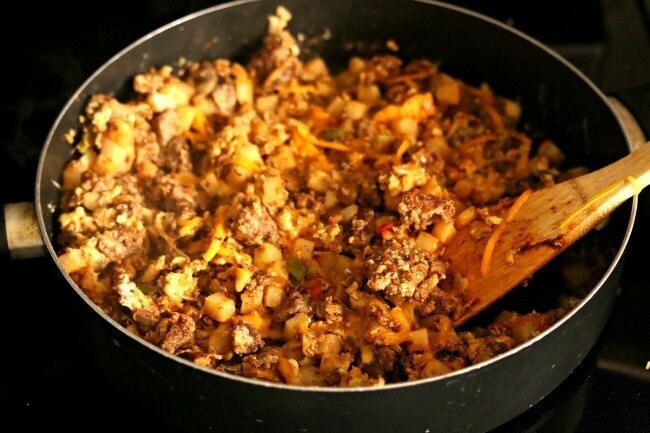 Start by browning some ground sausage in a big pan. Add frozen O’Brien hashbrown potatoes and some cumin and chili powder. Then you’ll add in some eggs and scramble them. This mixture will be the filling for your enchiladas. Then, scoop about a half cup of the mixture into the middle of a tortilla. We like to use whole-wheat tortillas, but you can use whatever kind you like best. 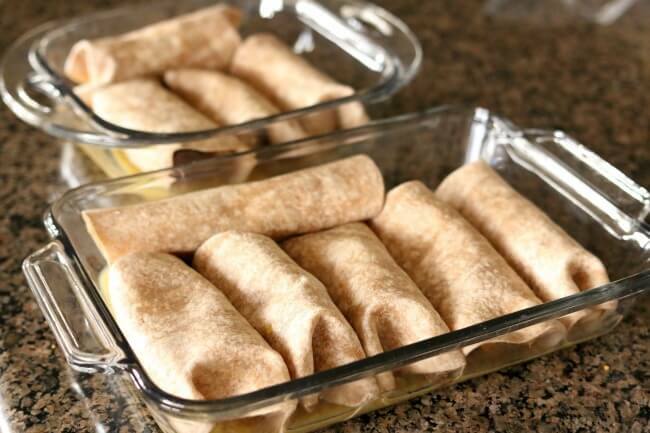 Roll up the tortillas, and place them in a pan. I ended up using one 8×11-inch glass pan and one 8×8-inch glass pan. 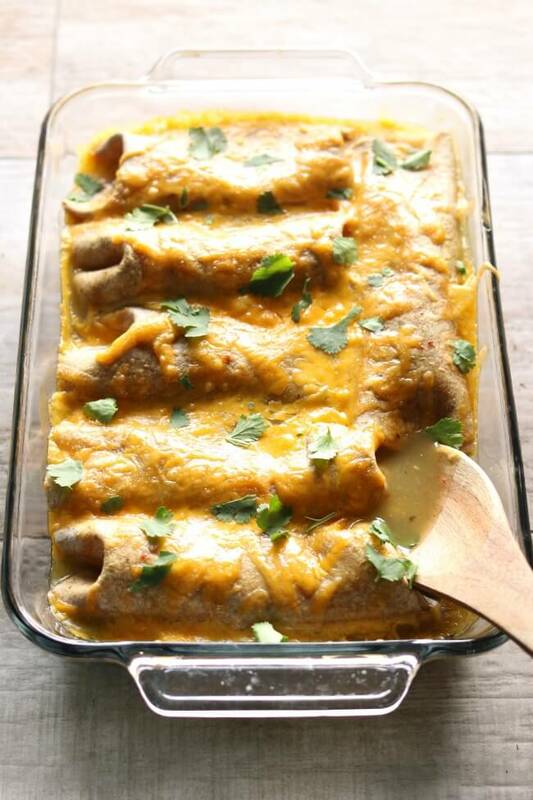 I then poured green enchilada sauce over the tortillas. I love green enchilada sauce, but if you prefer red enchilada sauce, feel free to use that instead. Don’t forget the cheese! I used plain cheddar, but a Mexican cheese blend would taste great as well. Pop the dish in the oven for 20 minutes, and then enjoy the cheesy deliciousness. Step 2: Heat a large pan on the stove over medium high heat. Add the sausage. Break the sausage up with a wooden spoon, and brown it until it is mostly cooked through. Then add the frozen potatoes. Sprinkle in chili powder and cumin. Let the potatoes heat through. Step 3: Add in the beaten eggs. Scramble the eggs. When they are cooked through, add a half cup of shredded cheese. Let it melt. Remove the pan from the stove. Step 4: Pour about half a cup of the enchilada sauce into the bottom of the pan you want to cook your enchiladas in. I used one square glass pan and one rectangular pan. 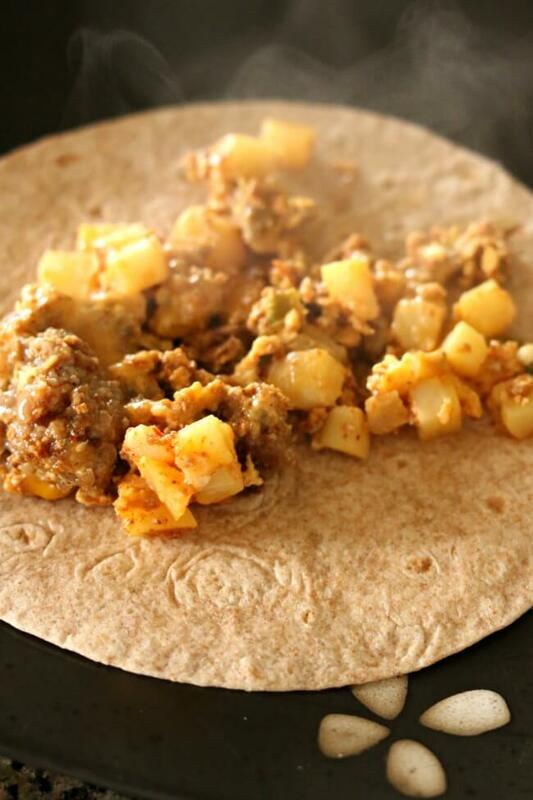 Fill each tortilla with half a cup of the egg-sausage-potato mixture and roll up. 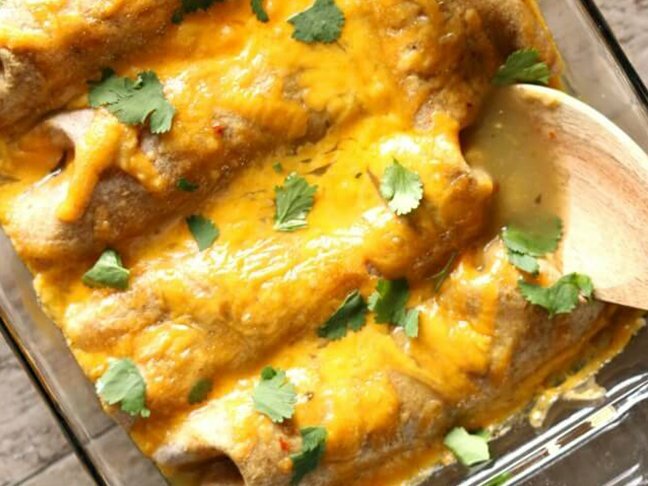 Place the rolled enchiladas seam-side down in the baking dish(es). Sprinkle the remaining cheese over the top. Step 5: Bake for 20 minutes. Serve and enjoy!